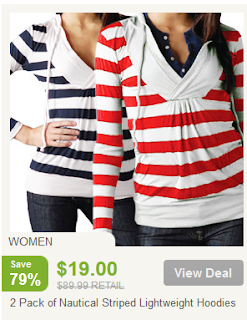 Beth Ann & Jessica's Helpful Savings: NoMoreRack: $10 credit and 2 pack Nautical Hoodies just $21 shipped. NoMoreRack: $10 credit and 2 pack Nautical Hoodies just $21 shipped. 2 Pack of Nautical Striped Lightweight Hoodies $19 with $2 shipping from NoMoreRack, like paying $10.50 a piece shipped. Get a $10 coupon for NoMoreRack here. I believe the coupon is for purchases $40+.